This was the first, um...representational cake that I can remember making. It's the first one I photographed, anyway. It was for my sister's birthday, and I remember feeling rather clever as I put this together. It's 4 layers of chocolate cake (always chocolate when it's Mere's birthday) with chocolate frosting in between. I particularly remember how important it was to me that I achieve the CORRECT shade of orange to match the pumpkin I was copying. I only had one of those little 4-packs of liquid food coloring, and I think I probably added red and yellow a drip at a time, stirring thoroughly after each addition before deciding what it needed more of. The stem is an actual pumpkin stem - I think it fell off a pumpkin that I was picking up. I know I soaked it in hot water for a while, maybe with a dash of bleach in there to kill any little germs or bugs hanging around. 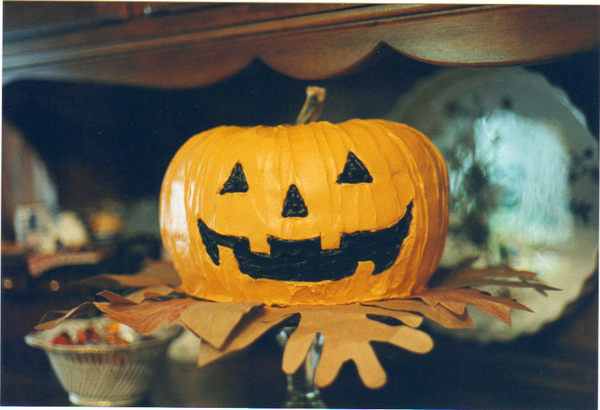 It's a jack o'lantern on one side, and on the back it says "Happy Birthday Meredith." I piped the black on top of the orange...but if I were to do it again, I would probably cover the cake with fondant instead of frosting...and I'd actually cut out the eyes and nose and mouth so there would be that 3-dimensional element that's lacking in this one. I think I remember scooping frosting off the face of the pumpkin when I did this one. I'd try to make the bottom of the pumpkin more rounded and realistic too. But still...not a bad start to my little hobby.